Some years ago, my father brought our first doe home to start our homestead dairy. Her udder was so huge i was so afraid to touch her. If you know anything about goats, then you can imagine how the first milking went. Somehow we got through it. And phoebe is now an exceptional milker. Thanks to the trials and tribulations, she put us through, and the series of does i trained since i am now quite competent at training goats to milk on a stand too. If you want to have an easier time training new does, than I did training Phoebe, here are a few tricks to help. 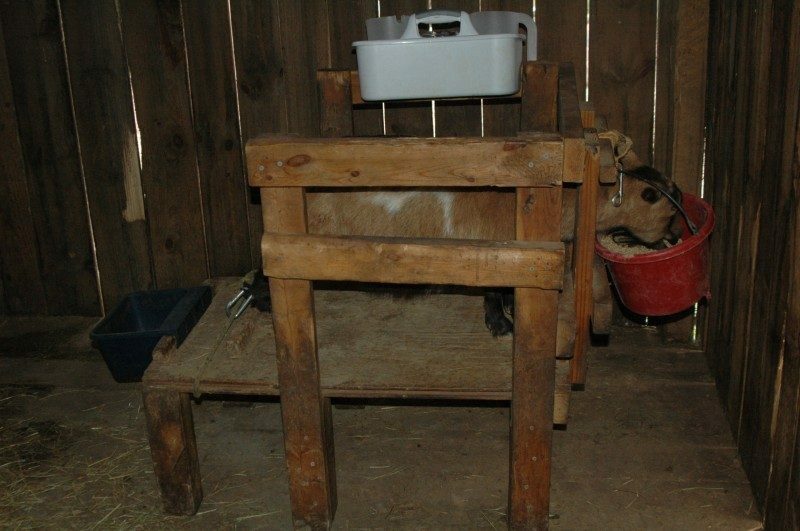 The milking stand is a tool to make milking easier on you and ensure good goat behavior during milking. In general, stands are elevated to make udder access easier. They have head enclosures to trap goats on the stand. 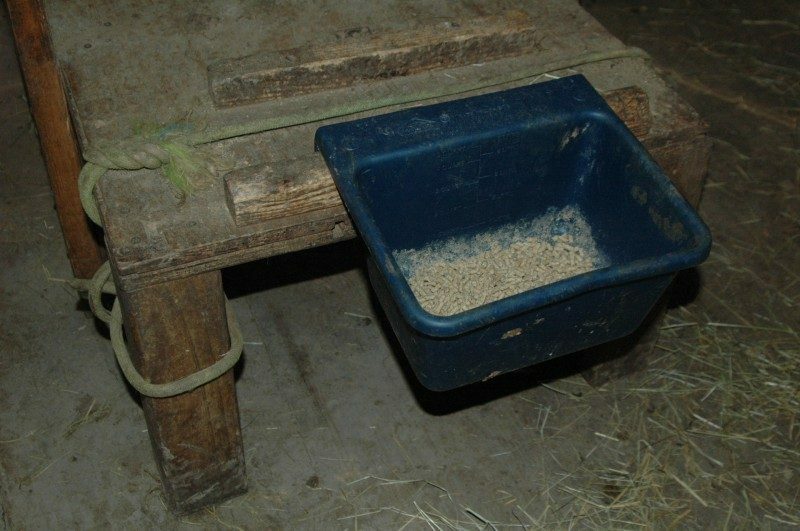 They also have a spot for a feed bucket to occupy your doe while you milk. Beyond these basics, there can be a lot of variation in milk stand styles. For training purposes, I recommend using a stand with side rails and a hobble. New milkers often try to trick you by jumping on the stand, pretending they are going to cooperate, and then swerving off the stand just before you get them secured. Then you have to catch them, drag them back to the stand, and start all over again. Since goats don’t like to back up, those side rails and head enclosure help trap them on the stand until you can secure the neck lock. 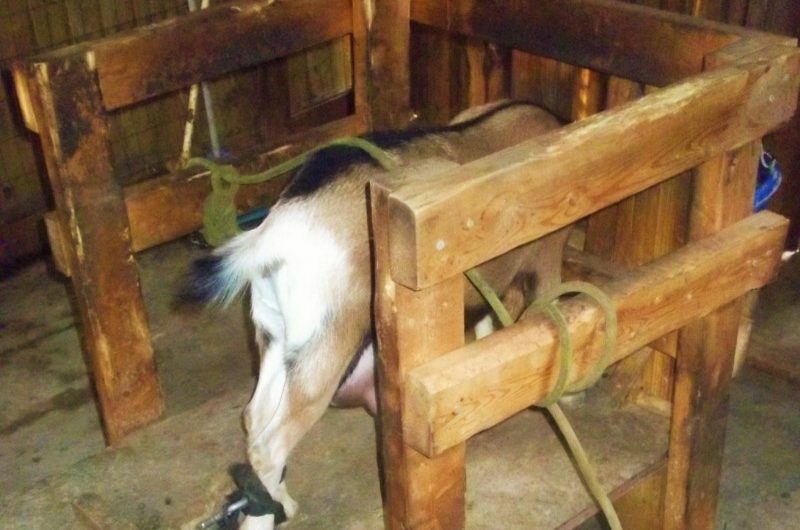 Side rails and a training rope can also be used to overcome the two most common ways a goat will try to prevent you from reaching their udder. Some goats will lay down on the stand to protect their udders. By leveraging a rope over the rails and under your goat’s hind legs, you can easily keep their udder elevated. Other goats will try to buck. By leveraging a rope under the rails and over their hindquarters, you can stop bucking. Some goats try both maneuvers. You may need to use two ropes to immobilize difficult goats. After thwarting a goat’s efforts to lay down or buck a few times, they usually give up. I keep goats tied in for several milkings after they stop these bad behaviors to make sure they got the message. Does instinctively kick their baby goats off their teats after they have suckled for a bit. This prevents kids from over-eating and getting bloat. Does also use their hind legs to repel unrelated or rejected kids. When you milk a doe, you will take more milk than a mother would naturally allow. You are also not her kid, so she will attempt to kick you off as she would an unrelated kid. Using a hobble helps override these basic instincts and prevents accidental milk spills (or a hoof in your collection container). You can buy padded Velcro hobbles from goat supply stores for full-size goats. However, it’s hard to find a pre-made hobble that works for all mini-goats. I made my own hobble by tightly tying a rope around the foot and leg of my stand. I put storage straps on a carabiner and clipped the carabiner to the rope. Goats like to nibble on nylon. You can unclip the carabiner from the rope and store your hobble between milkings. 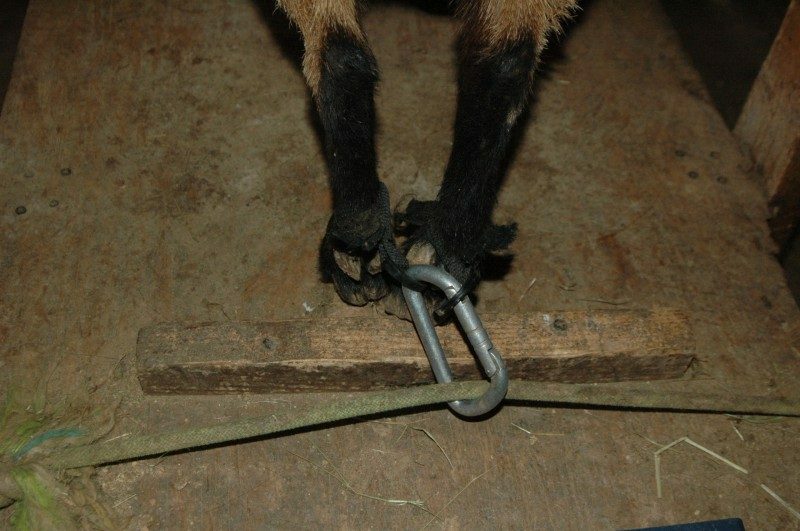 While training a goat, I securely tie their feet with the straps to completely suppress their kicking habit. After they are trained, I loosely tie the straps as a physical reminder not to kick. The standard milk stand looks and functions much like a medieval torture device. Your goat won’t necessarily appreciate the physical similarities to a village stock intended as punishment. However, they will immediately comprehend their own vulnerability when you lock their heads in place. If that goat doesn’t know and trust you when you immobilize their neck and steal their milk, they are going do everything in their power to protect themselves! Before you bring the milk stand into the picture, take some time to establish a positive and trusting physical relationship with your doe. 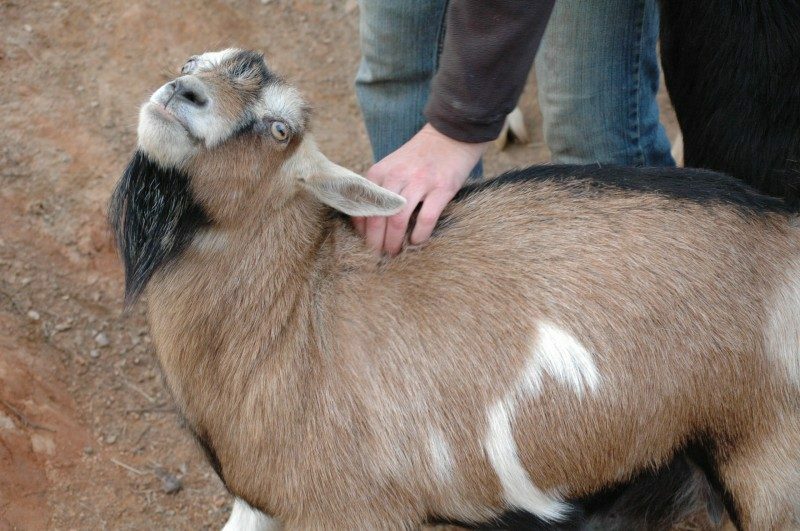 Do this by giving your goat a whole body massage. Stand to one side of your goat, so they don’t feel trapped. Massage your goats at the withers – where the neck meets the shoulders. Work your way along the spine toward their tail. If you exert deep pressure along the spine, most goats will arch or snake their necks and display their teeth like a smile. They love this! 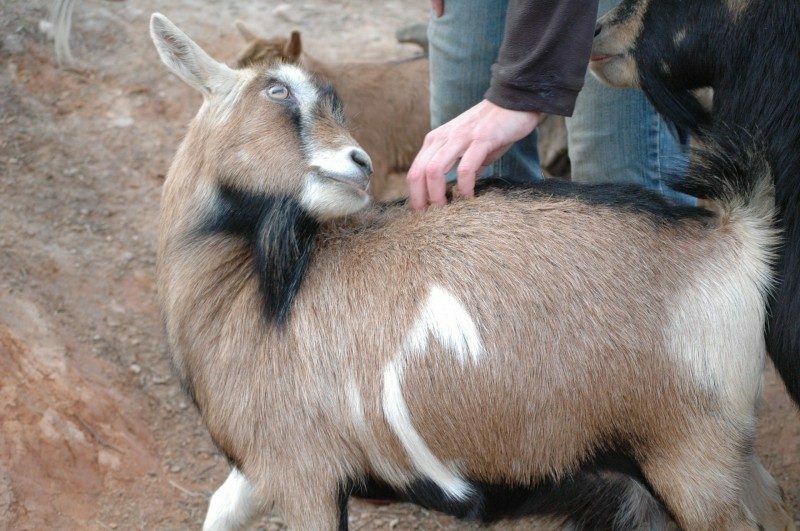 Scratch one side of your goat’s body including their hindquarters and undersides. Move to the other side and repeat. If your goat is not in milk, massage her udder. Handling her udder, before her instincts to guard her milk emerge, makes touching her udder easier on the stand. If your doe is in milk, massage around the udder, but avoid direct contact with the udder until your goat is on the stand. If you must establish trust in a hurry, you may need to repeat this exercise multiple times before attempting to milk your goat. Otherwise, do it every day in the few weeks before your does’ due date. This also allows you to make sure your doe is in excellent condition during her pregnancy. I like to acclimate goats to the stand, by feeding them from the back of the stand for a few days. This way they associate the stand with food. I added a 2 x 2 to the foot of my stand so I could hang a feeder pail for this purpose. After a few days, I put the feed bucket in place on the stand and push the stand into a corner. I guard the bucket to prevent my goat from eating without being on the stand. Generally, after a few minutes, the goat will give up trying to eat from the ground and jump up and put their head in the slot to feed. If your goat doesn’t get on the stand voluntarily, you will have to coax them. Guide them by putting one hand on their neck and another on their hind end. If your goat still doesn’t go, you may have to teeter-totter them onto the stand, by lifting their front legs, then hind legs onto the platform. Ideally, it’s best to let them eat from the bucket on the stand for several days before you lock their neck in place. As they eat, pet and massage your goats. Some goats will stop eating to enjoy the attention. Stop petting them, until they resume their eating, then pet them again. The idea is for your goat to get comfortable being touched as they eat on the stand. When goats are comfortable on the stand, lock the neck enclosure and begin to handle their udder gently. Use your side rails and hobble as explained in Tip # 1 to ensure proper behavior. If you have never milked a goat before, I highly recommend that you contact another dairy goat keeper to get a hands-on lesson with a trained goat before you try to train your own. If you can’t find someone to teach you, watch a lot of YouTube videos and visualize yourself as a great milker. “Air milk” imaginary goats to build your skill! We don’t always have the luxury of weeks to train a new dairy goat. Sometimes we just have to get it done. In that case, it’s important to understand that goats respond to a strong will. If you’ve ever watched goats headbutt for hours to solve herd hierarchy, you’ll know that it’s not necessarily the biggest goat that wins, but rather the most determined. Even if you are having a terrible time training your new doe and want to crawl in bed and cry over your incompetence (like I did that first day) – DON’T GIVE UP! If you need to train a goat in a hurry, then you must be more stubborn than they are. The sooner your doe realizes that she can’t out-compete you in a battle of wills, the sooner she’ll submit to the stand and let you milk with ease. Even after your goats are trained, they will occasionally test your resolve just as they occasionally test each other’s places in the herd hierarchy. Be prepared to correct bad behavior quickly to keep milkers in check. One of my greatest pleasures on the homestead is milking a well-trained goat. I call my does by name and one-by-one they come to the milk room, jump on the stand, and put their head in their feed bucket. I lock them in, wash their udder, sit down, and squeeze out long streams of steaming milk. There’s enormous satisfaction in having this kind of trust and cooperation with my does. I hope these tips help you have a similar experience on your homestead. Always remember to appreciate your does’ hard work and her delicious dairy contributions with a good spine scratch on the stand at the end of milking!